This page doesn't quite fit with the rest of the site. I could justify it by pointing to the trend towards contextualizing American studies in a global framework. But, to be honest, I spend so much of the year traveling that it just seemed odd to exclude it. Plus, I had a lot of fun picking out photos and posting them with my partner Jesse who, by the way, should be commended. He has visited more shrines, pilgrimage sites and churches than any computational biologist should. I've travelled a lot in the US and Canada but have only included a few photos here from the southern states, taken while I was working as a guidebook writer in 2006. If you can find it, I authored the Southern Border section of Let’s Go Roadtripping USA (NYC: St. Martin’s Press, 2007) p. 766-896. Oh, and a caveat: I use the cheapest digital cameras possible since I invariably lose or break them. So the images here are not always the best but each one illustrates something about the Christian landscape that caught my attention. Nothing tops Russia for beautiful churches. When we were there in 2005 a clear shift was taking place; although old people still held pro-Communist rallies in the streets, more and more churches were open and being renovated. For Easter, we attended mass in a traditional wooden church in Siberia. It was filled with candles and pine boughs, even the floor was covered. The scent of smoke and pine was phenomenal. top R to L: St Petersburg spires, repainting an Irkutsk interior; traditional wooden church and painted plaster/stone church in Tomsk, Siberia. 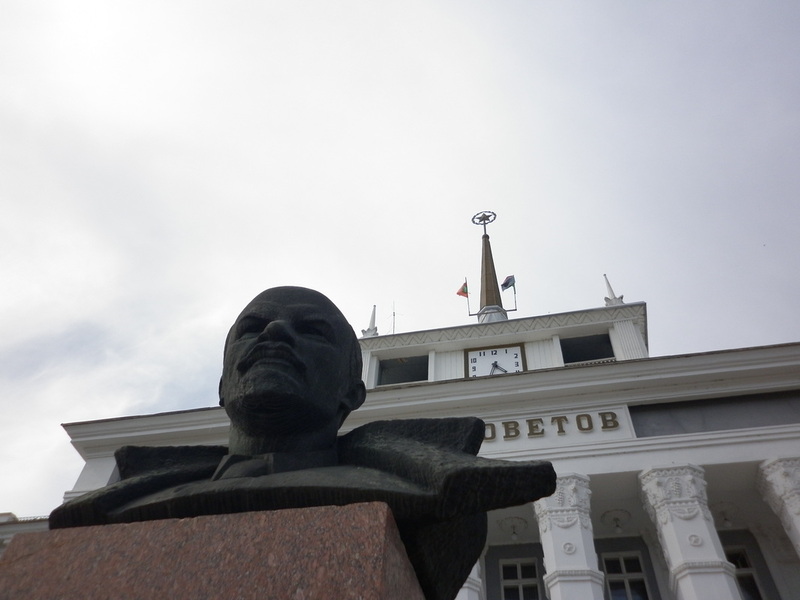 We were in Romania, Moldova and Transdniester in June 2011. 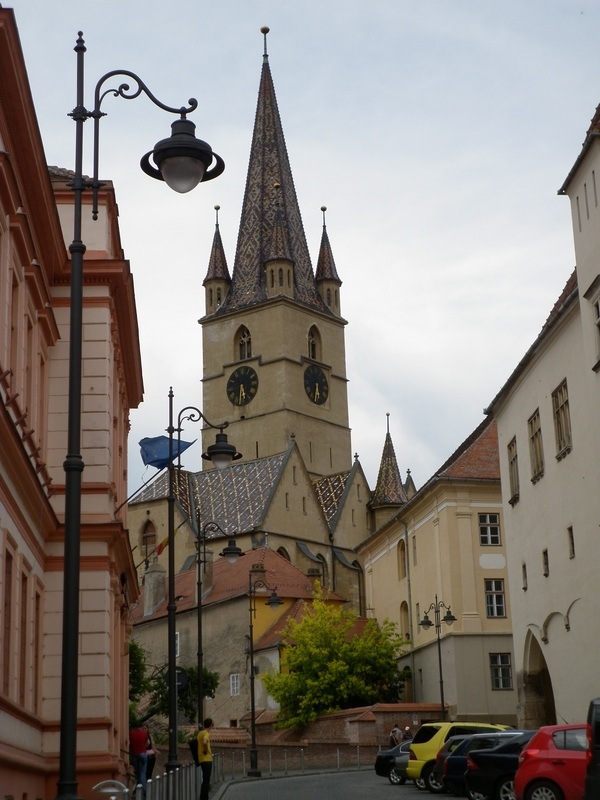 Most churches are Orthodox, with some Catholics, however we also saw a fair number of German-style churches - some Catholic and some Protestant (courtesy of the Transylvania Saxons who have been in the area since the twelfth century). 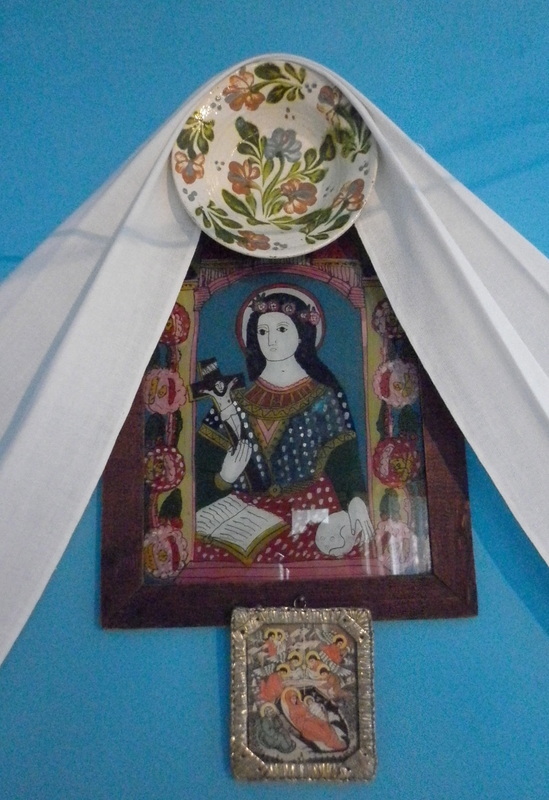 My favourite religious items were the hand-painted glass icons hanging in most rural homes. 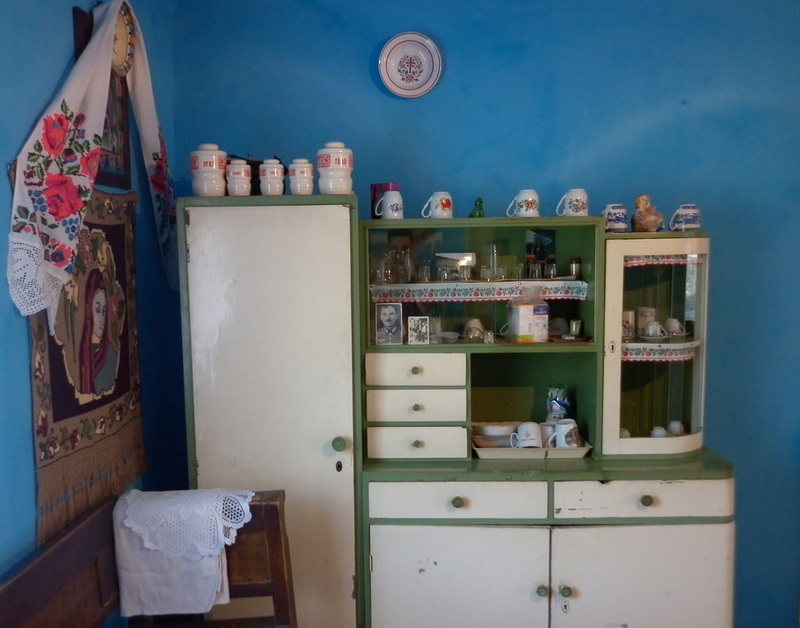 The photo below is from the kitchen of a rural farm house where we camped overnight when our hitchhiking luck ran out. It's impossible to stay friendless in Romania. Soon we were eating more bliny and drinking more vodka than we'd bargained for - lucky we had saints looking out for us. Summer 2007 was all Turkey. We hiked, hitched and ate phenomenal fruit. Turkey has some of the oldest Christian churches, including cave churches in Antakya (Antioch) said to have hidden St. Paul. One of my favourite memories was sleeping on the roof of a monastery outside the town of Mardin, near the Iraqi border. We woke up early and were the only audience members for the 6am Syrian Orthodox mass conducted in Aramaic. The gestures, language and chants were startling similar to traditional Jewish services. Above: Sümela Monastery, near Trabzon. 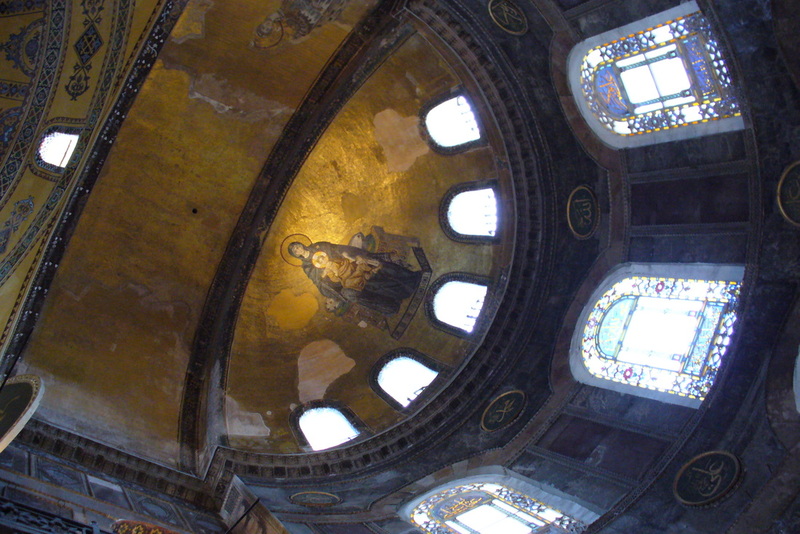 Below: Theotokos (the mother of God) looks down from the roof of Istanbul's Hagia Sofia. Top R to L: Glass icon in Ciuesti village; Roofed crosses at crossroads - common in Romania; Saxon church in Sibiu. Below: religion of a different sort in Transdniester, a breakaway state that is the last bastion of Soviet-style communism. 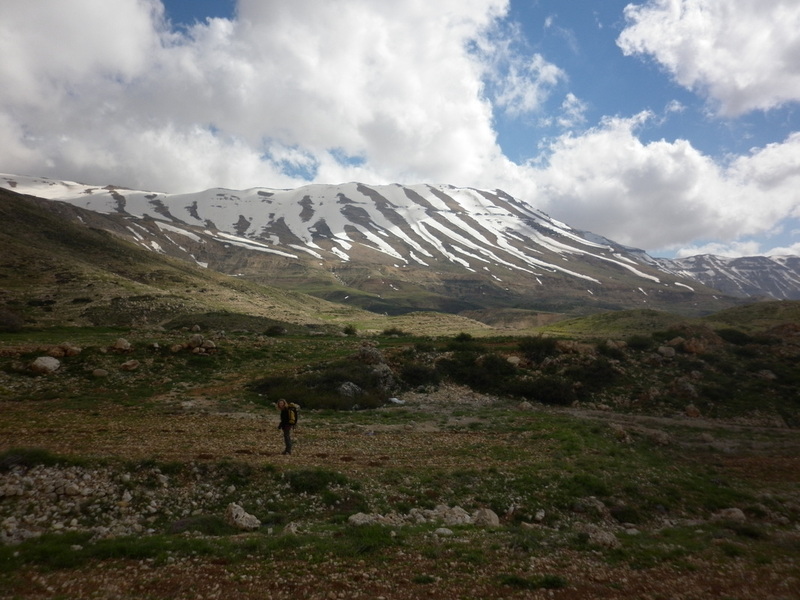 I've been to the Middle East a few times over the last decade: Israel, Egypt, Jordan, Syria and Lebanon. Most of that travelling has been solo. 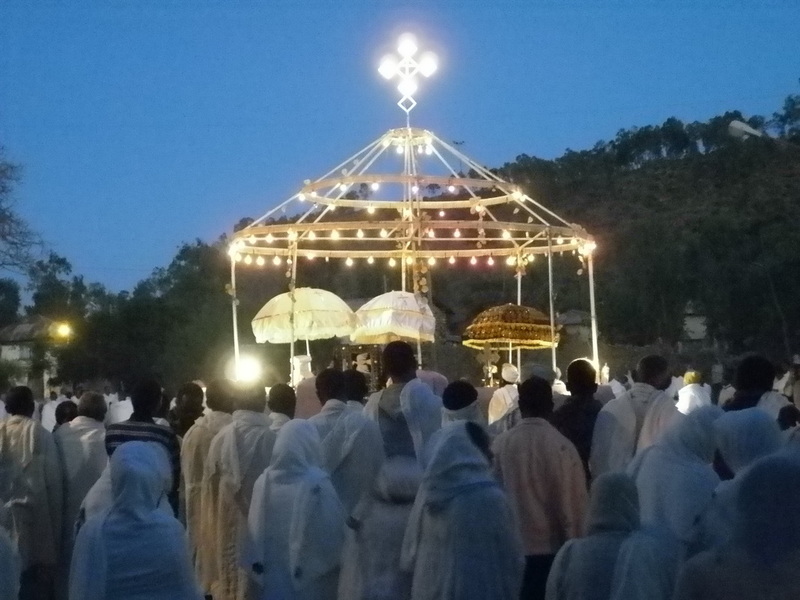 I wish I had photos of the nighttime pilgrimage I made at St Catherine's Monastery in the Sinai. From the mountaintop it looked like a highway snaking through the desert but it isn't car headlights. It is hundreds of pilgrims trudging up, holding candles aloft. 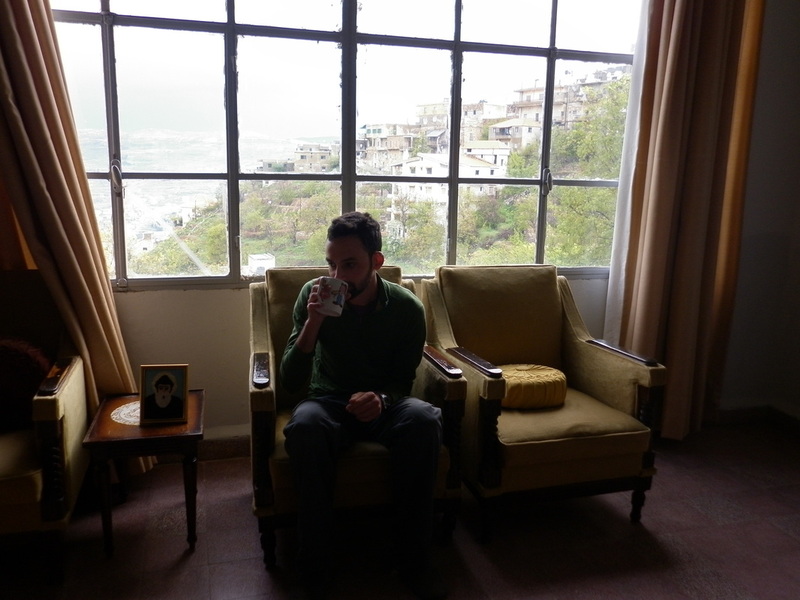 Above: Our Lady in a Beirut wall; on L mountains outside Bekaa Kafra and below Jesse warms up with coffee and St Charbel's image. 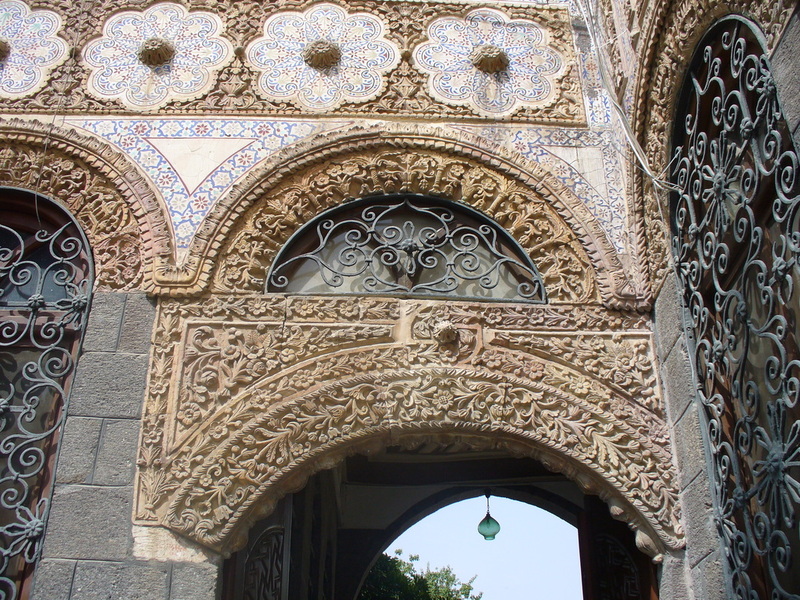 A church doorway in Damascus and (below) inside are tokens of thanks for healings. 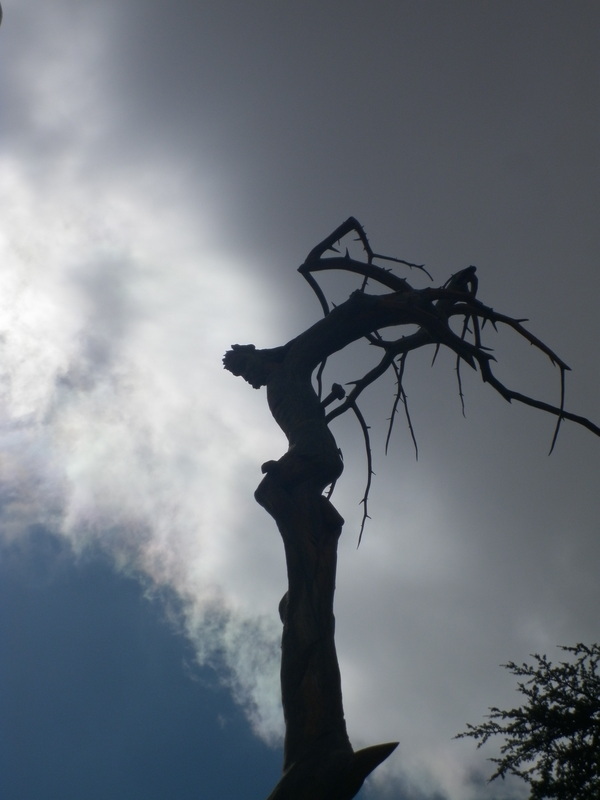 Below right: Carved crucifixion in Shouf Reserve, Lebanon. 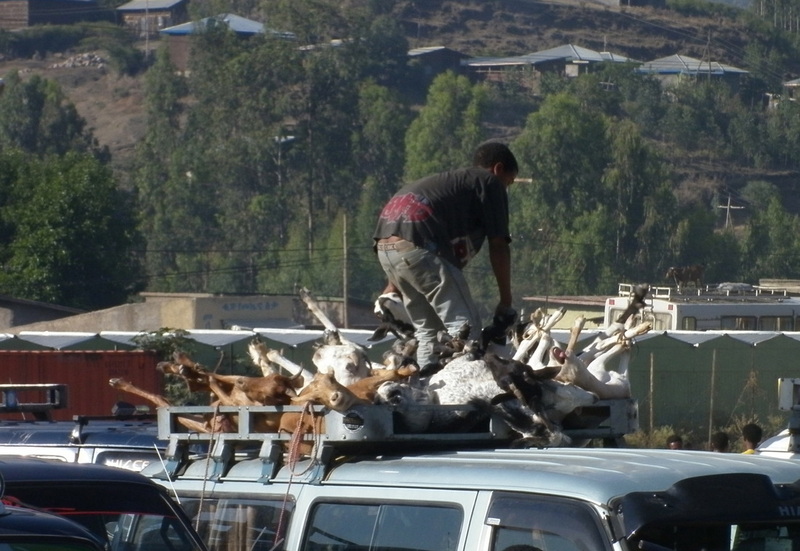 (apart from Muslim areas in the east) and then a massive goat slaughter. We celebrated with (new) friends: dorot as usual and an amazing goat dish. Too bad we had to hear the goat die next door...Ethiopians are also dead serious when they describe how the Queen of Sheba and King Soloman had an affair. 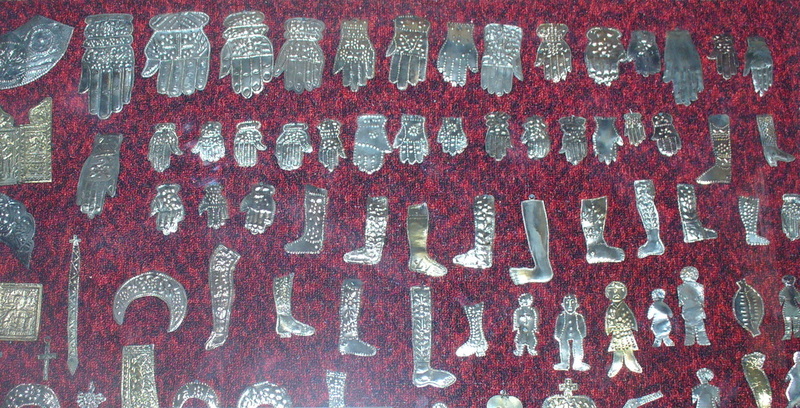 The belief is that, through their son, the Ethiopians acquired the Ark of the Covenant, now housed at Axium. We were there for the week when they parade the Ark through the streets at dawn. 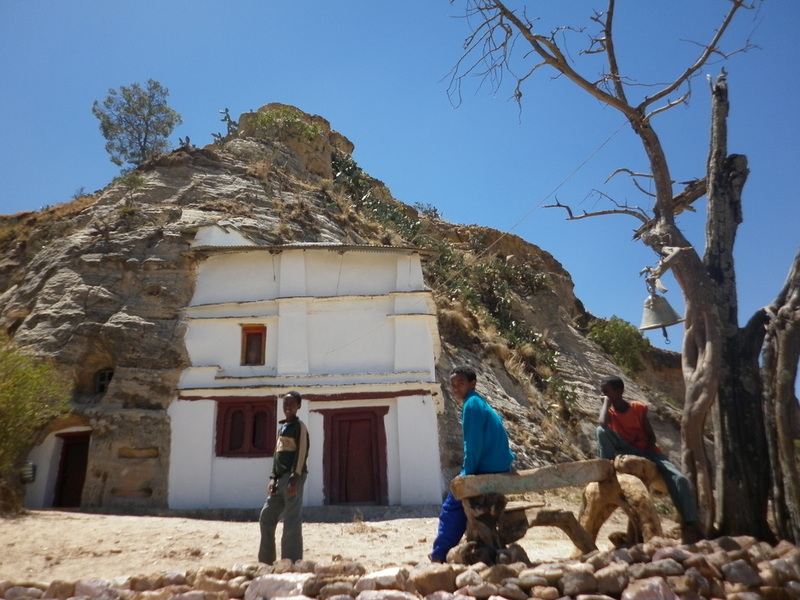 Cliff church in Tigray, Ethiopia. The boys pictured climb up the (steep!) 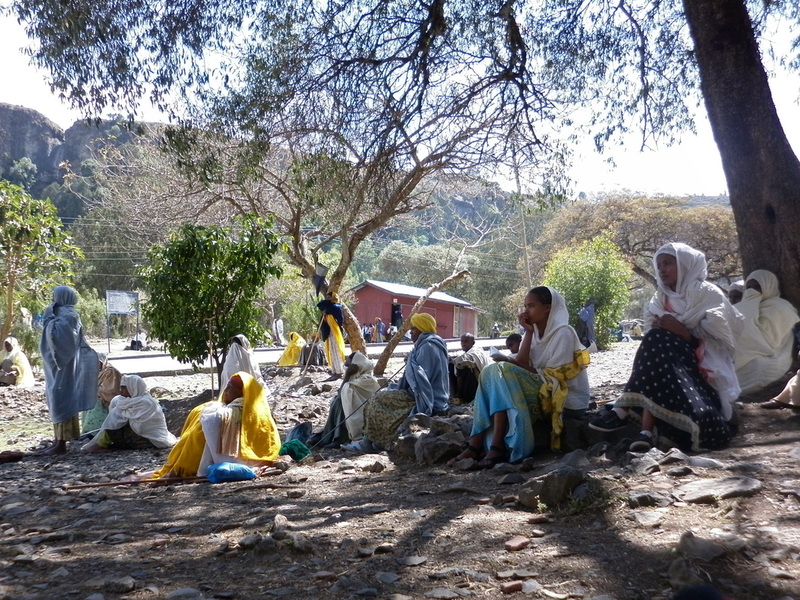 mountain daily to learn Ga'ez, the ancient Semitic language of Ethiopian scriptures. Often this is the only reliable schooling for the boys (girls stay home), however that day the priest was a no-show. We waited with them for a couple hours and then checked out the board games and graffiti they had carved into the soft rock on the cliff face. Below: Our friend Desda's sister's friend (yes, really) conducts an Easter coffee ceremony for us in Lalibela. 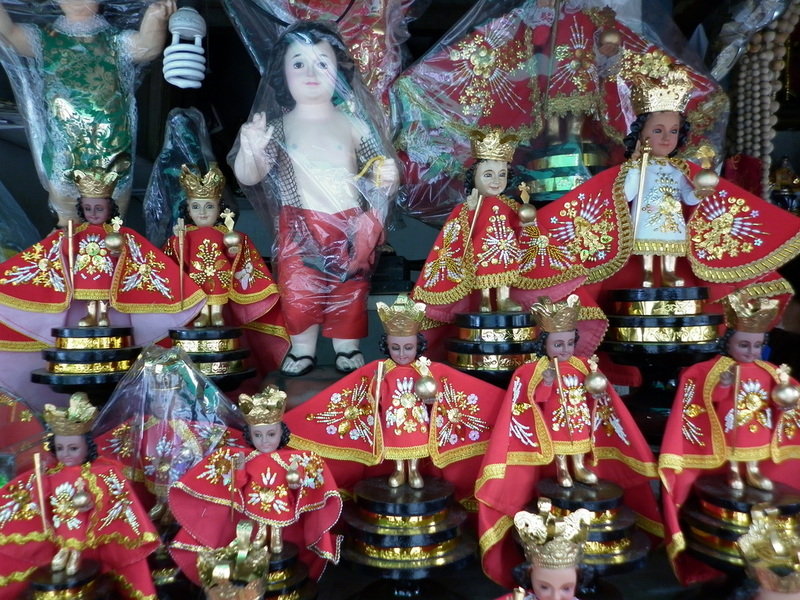 The Philippines is a joy if you like colorful saints and fiestas. 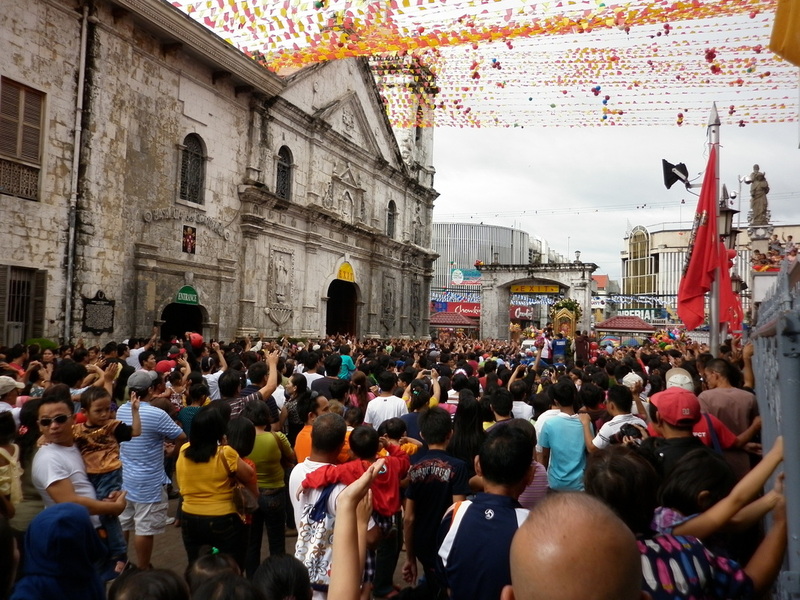 We had an amazing time at an all-night Virgen fiesta in a Bohol Island village and a confusing time at the very ruckus and rainy Santo Nino fiesta in Cebu City. Filipinos adore the Nino (in fact his first US shrine just opened in Tampa, FL. See photos here). It is believed that the small, wooden statue of the Sainted Child came to the island in the sixteenth century with the first Spanish explorers. It was lost but miraculously withstood destruction and was re-discovered once the Philippines was Christianized. Today the Nino is one of Filipinos' most favored intercessors. And he throws a good party too! 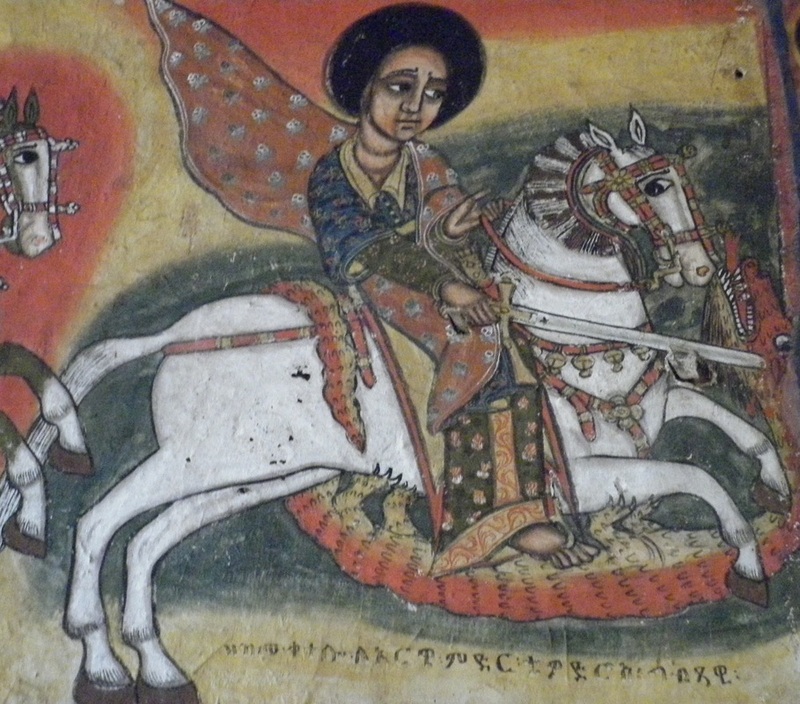 St George is ubiquitous in Ethiopian churches; Left: Unhappy goats lashed to a bus during Fasika. Waving goodbye to the Nino as he leaves the Cathedral square after mass (one of his replicas is being borne out but is barely visible in this photo). The crowd touches their handkerchiefs to him for blessings. Above: Sto. Nino statues for sale in the streets. A grandmother in the know helped me pick one out to buy. 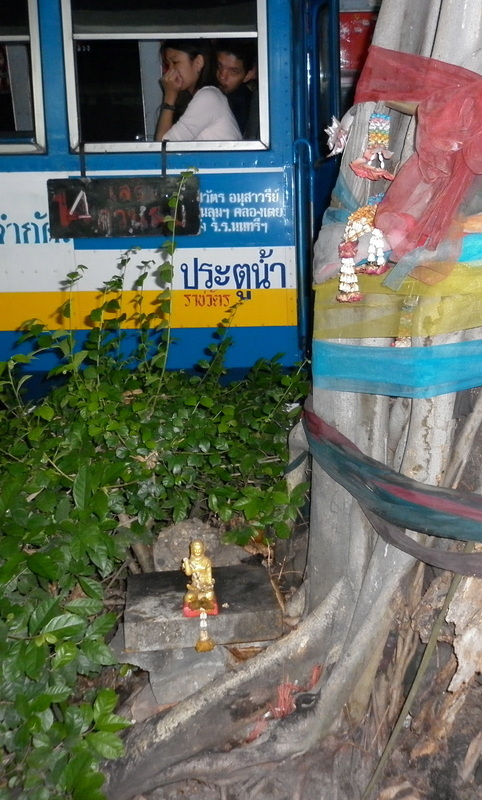 Religious iconography is typical on public transport in many places. 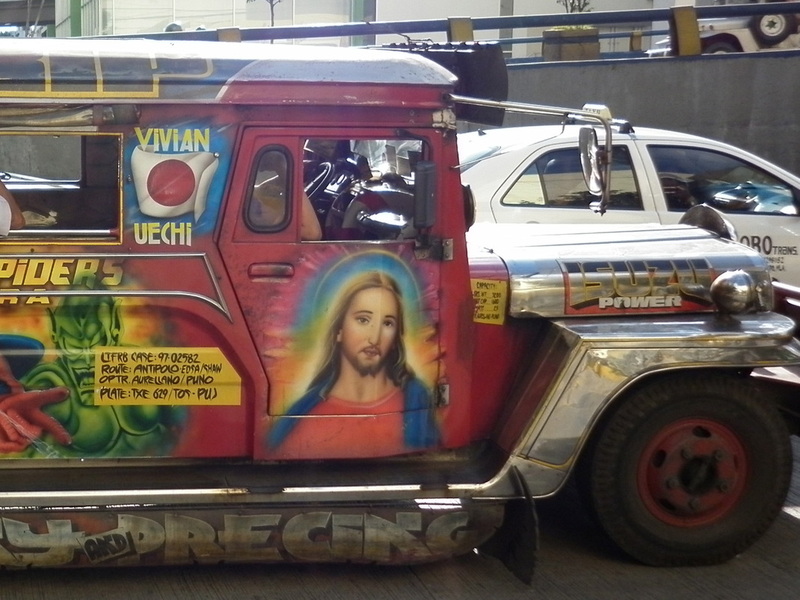 Above: Jesus spraypainted onto a Manila jeep-bus. 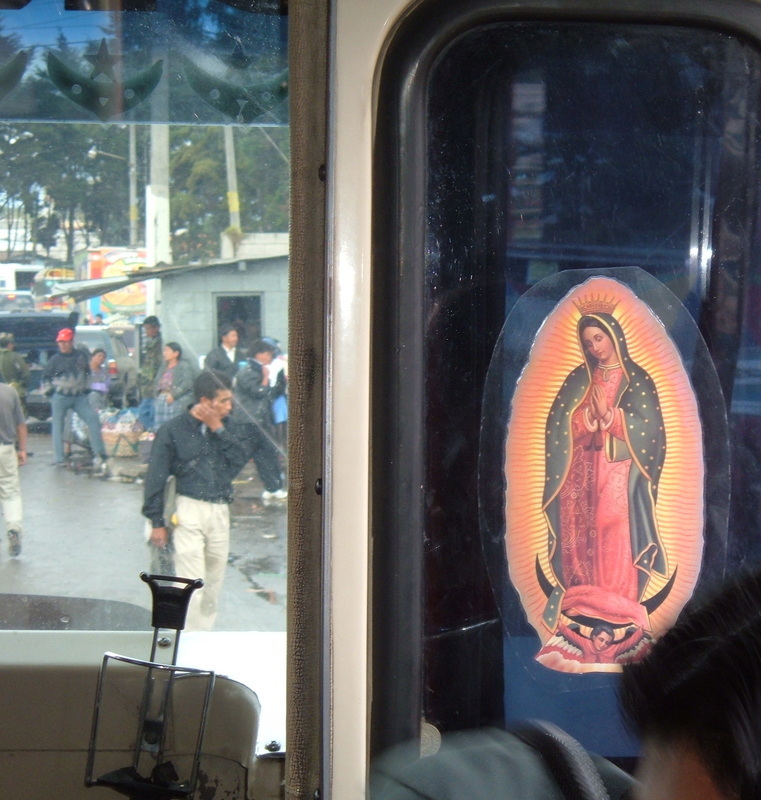 Right: Guadalupe on a Guatalmalan bus. 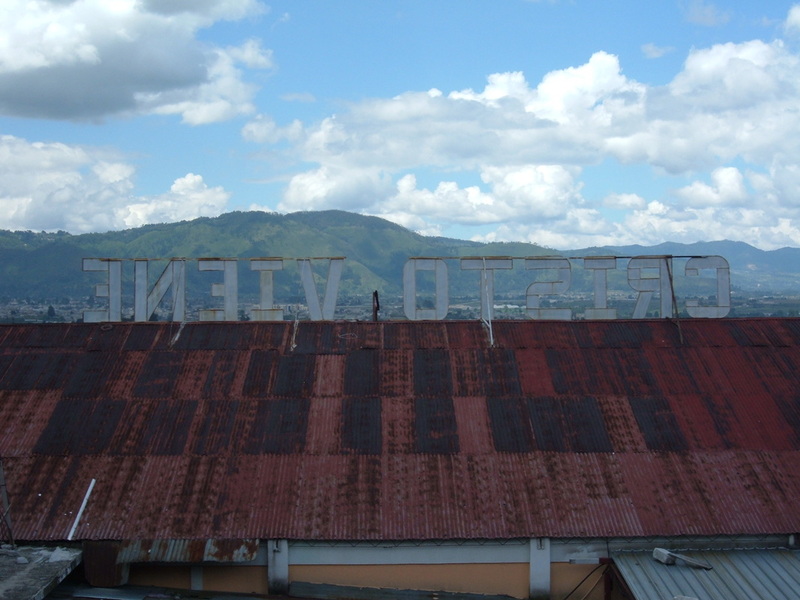 I was in Guatamala for three months in 2006 learning Spanish in Xela and travelling around. We were also in Nicaragua in 2007. In both places, Catholic culture is vibrant but "evangelicos" (often charismatic Protestants) are evident everywhere as well. This is common across Asia and Africa too. 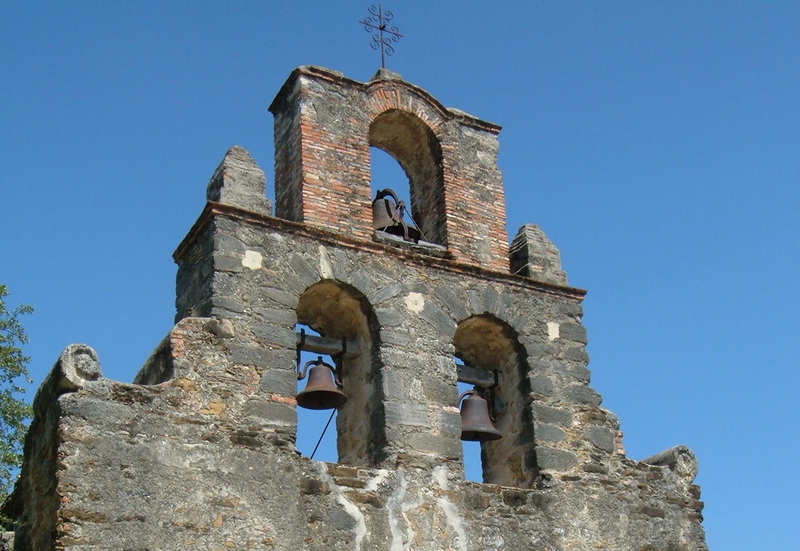 Certainly, evangelical ties to (often) US-based churches is a helpful plus for many converts. But women in Guatemala and in Ethiopia also spoke to me about their conversions in pragmatic terms: it is a faith that's good for women. In Guatemala, I heard most often that women liked the strict prohibitions against drunkenness and adultery. In Ethiopia, Muslim women in particular described searching for a faith that valued women's literacy and was against arranged marriages. Signs of Protestantism. Left: "Christ is Coming." 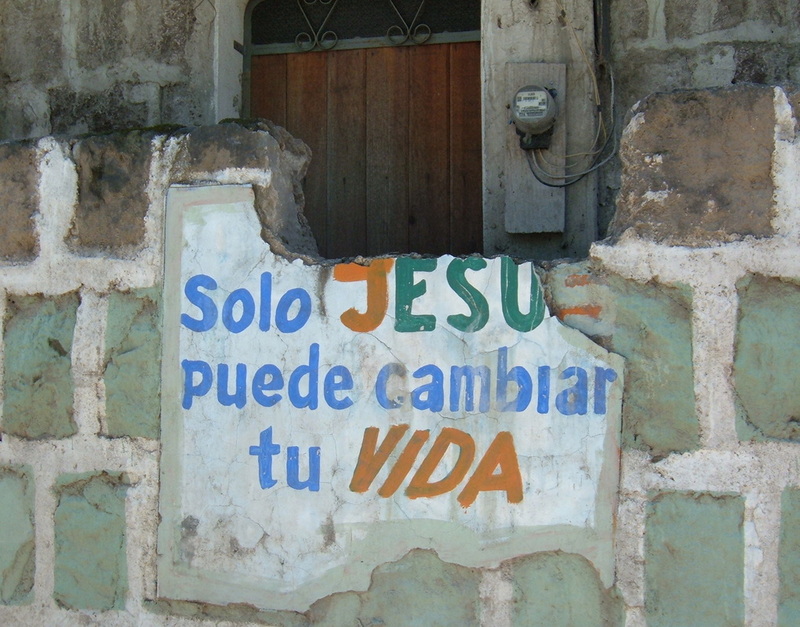 Right: "Only Jesus can change your life." 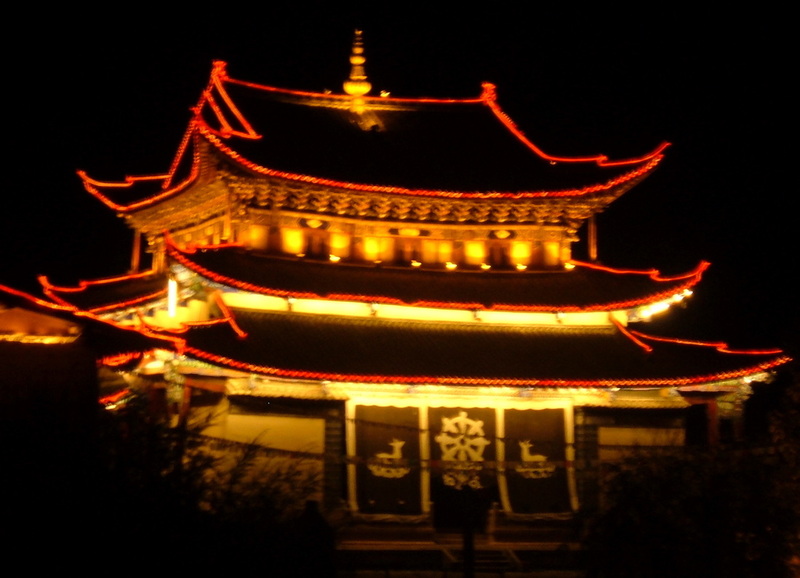 Tiny Buddha sits at a busy Bangkok intersection (2011); Nighttime pagoda in Lijiang, China (2005). Christian-related photos are harder to come by in Asia than in Latin America and the Philippines...so I've included a few stupas and Buddhas here. Myanmar Buddhism was particularly vibrant (and is strongly promoted by the government). 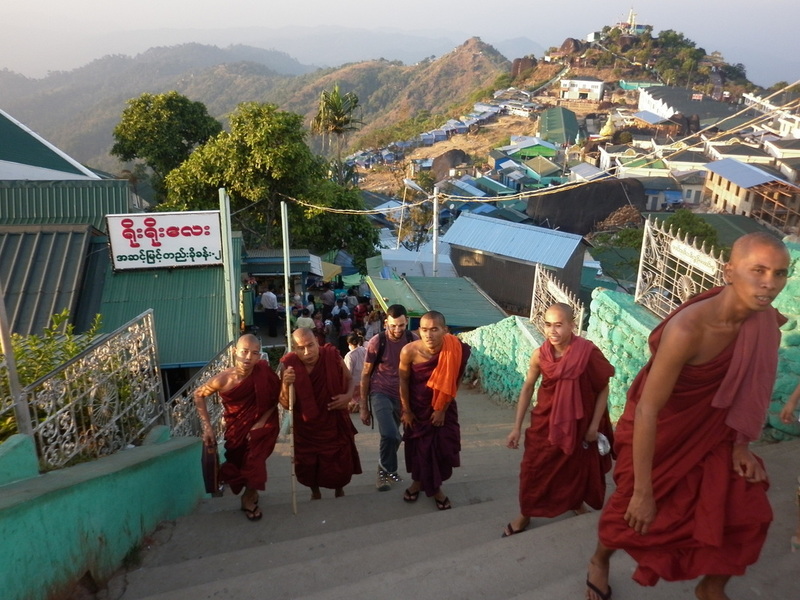 During our month there in 2011, we joined a full moon festival in the village of Kon Hut (near Namshan), waved to many a Nat shrine and joined the pilgrimage crowds at Mt Popa and the Golden Rock. 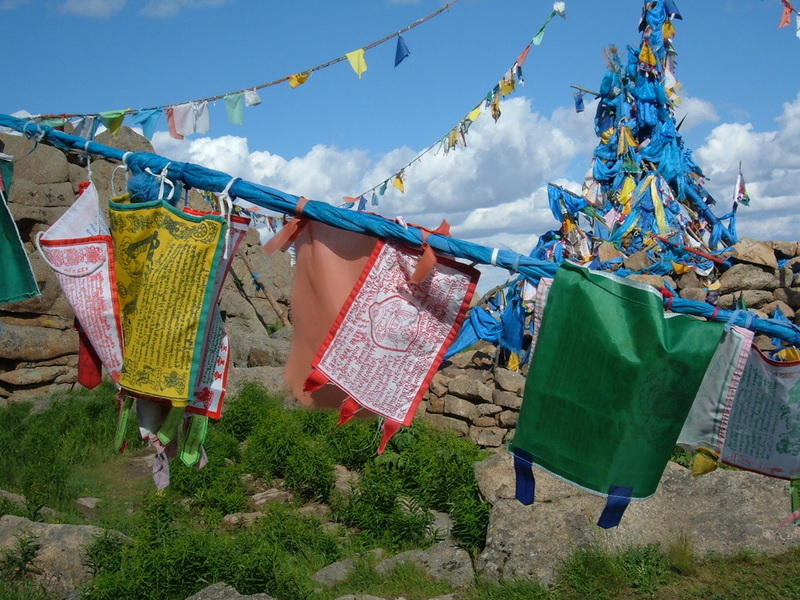 Stupa and prayer flags in Mongolian steppe; Below: a more permanent row of supas on the Tibetan border (2005). 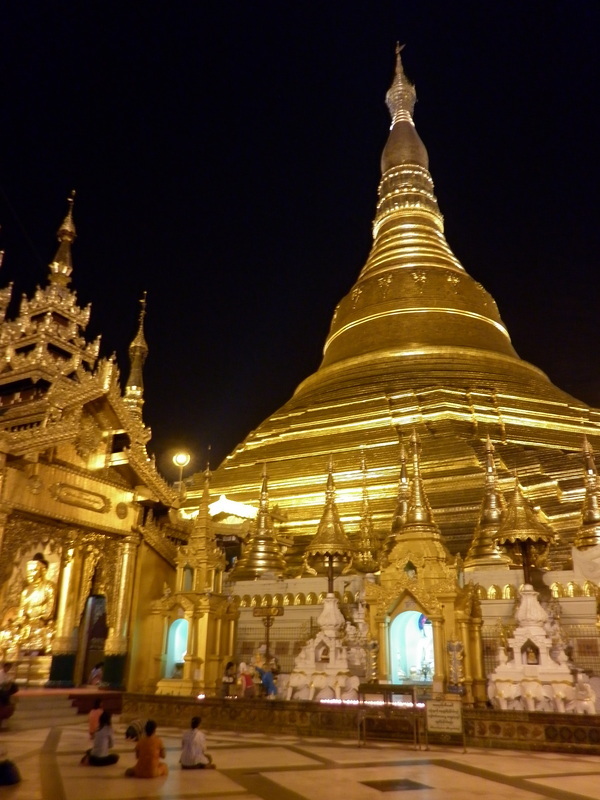 Buddhas meditate in Shwedagon complex, Yangon, Myanmar; Below: Shwedagon temple at night (shweda means golden in Bamar - you can see why). Nat worship is ubiquitous in Myanmar. Most people described Nats as the spirits of the dead who can help or harm the living. Often they died tragically or suddenly. The monk below thought it was funny that I wanted a photo of his large Nat tattoo but he obliged. At right is a Nat house outside a village. Often they have tiny furniture and other niceties so the Nat can live comfortably. Coming in and out of villages, many Myanmar people wave a respectful hello to the Nats and then bow to the Buddhist temple. Below: a Nat at Mt. Popa (the largest Nat pilgrimage in Myanmar) accepts donations. Dancing with excitement the afternoon before the full moon festival in the mountain village of Kon Hut. 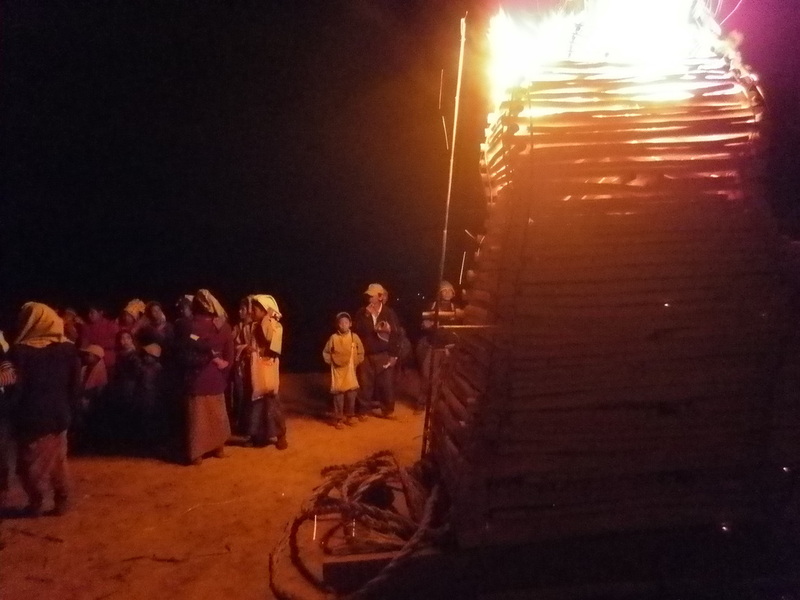 We were invited for a full moon party in the village of Kon Hut. As the sun set, the mountain people came into the village in their distinctive tribal dress. The festivities began with hours of tug-of -war (girls vs. boys). The men won, which seemed unfair to me since I was the only woman under 65 on our team without at least two babies strapped to her. 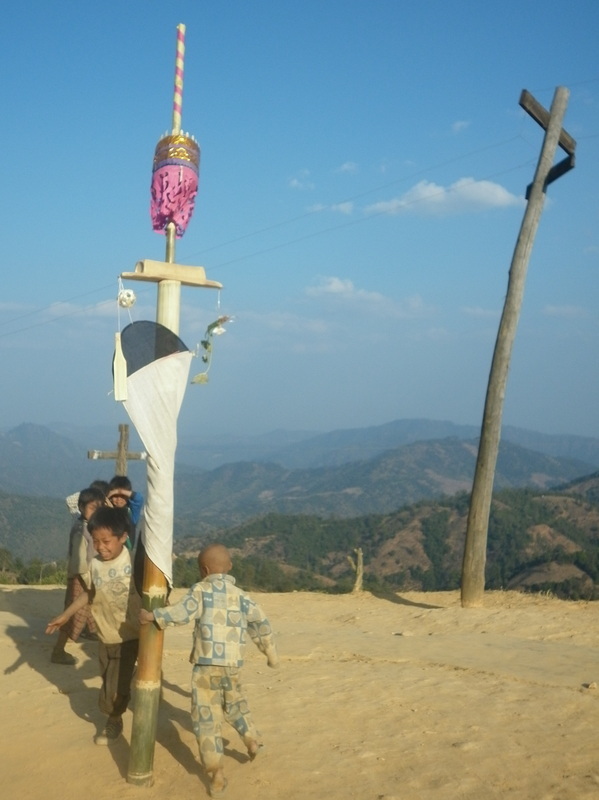 Then the whole village dragged a 25-ft wood pyramid up to the Buddhist temple. In fact, mainly we women dragged it: "Sa! Sa! Sa!" we yelled in unison (presumably palaung for "pull, pull"?). Once there, the pyramid was torched and us girls danced around and around as it burned down. Summer 2012 in Cambridge and Somerville, MA. 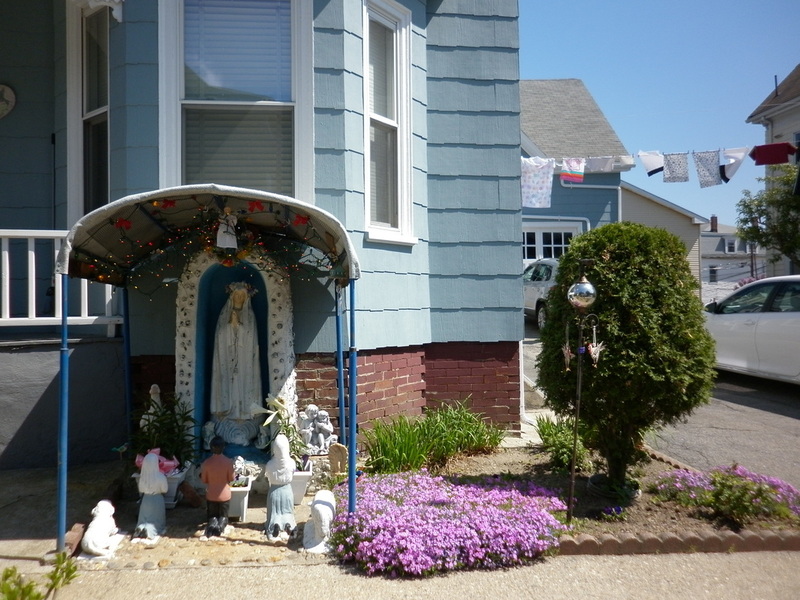 The Portuguese family down the street from us is only one of many with a bathtub Madonna but theirs is a particularly impressive Fatima recreation. An angel flutters overhead while Lucia, Jacinta and Francisco kneel before Mary. 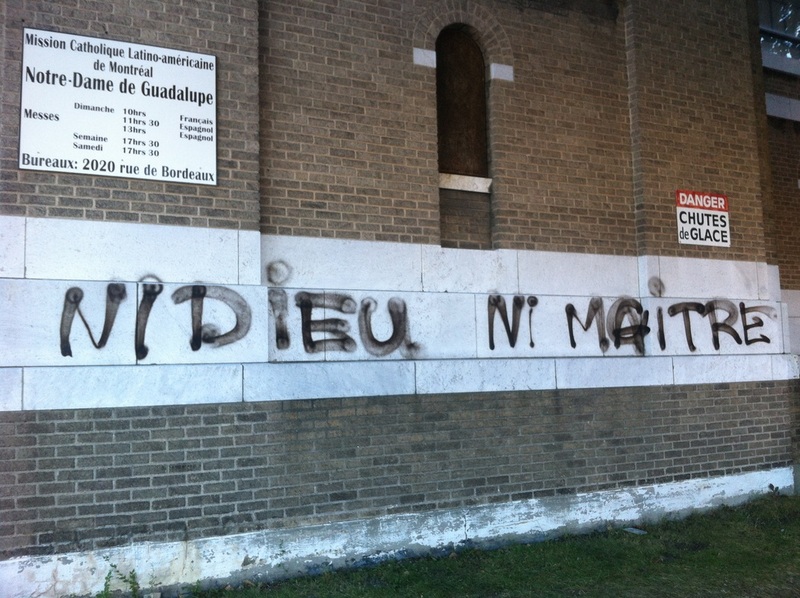 Back at home in Montreal and greeted by some new graffiti on the Cathedral down the street. Still working out some issues with religion in this province. We travelled to Georgia and Armenia for five weeks in 2013. 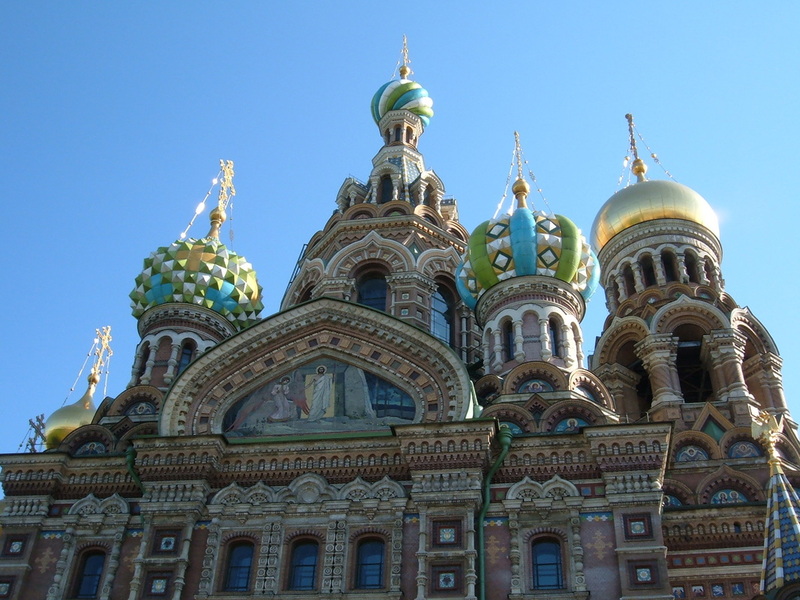 Both countries have their own national churches that go back about 1700 years. 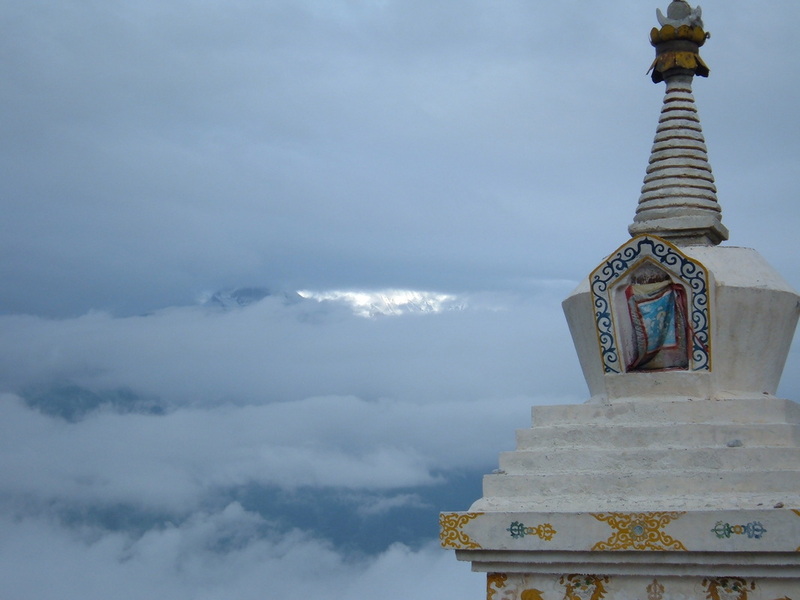 Both also have beautiful stone monasteries, usually at the top of mountains. Above is the interior of Sameba in Tiblisi, the main Cathedral of the Georgian Orthodox Church. 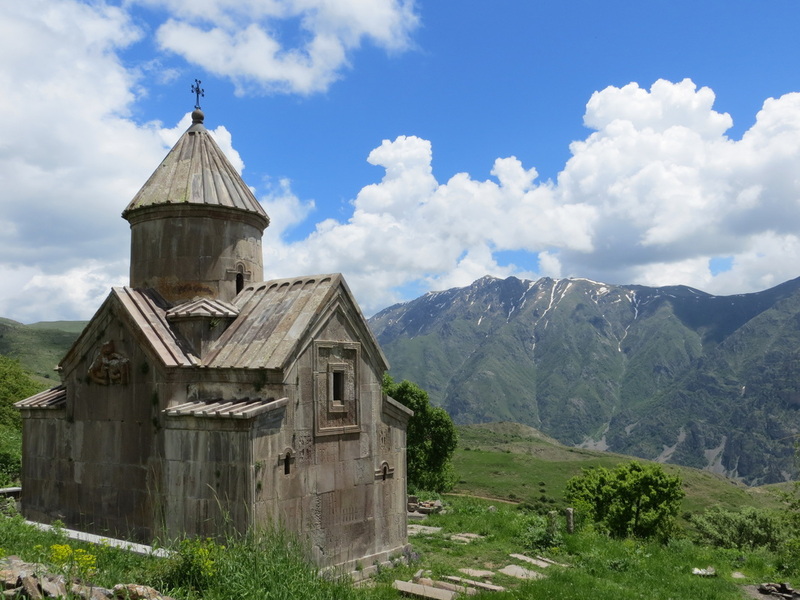 Above: monastery in the mountains about an hour's hike from the village of Artabyunk in central Armenia. In the fifteenth century, this was one of the many monasteries dotting the countryside. It would have included chapels, libraries and monk's quarters. Each monastery "owned" (the word Armenian tourist info panels always use) various villages around it, which supplied the monks with taxes and/or food. 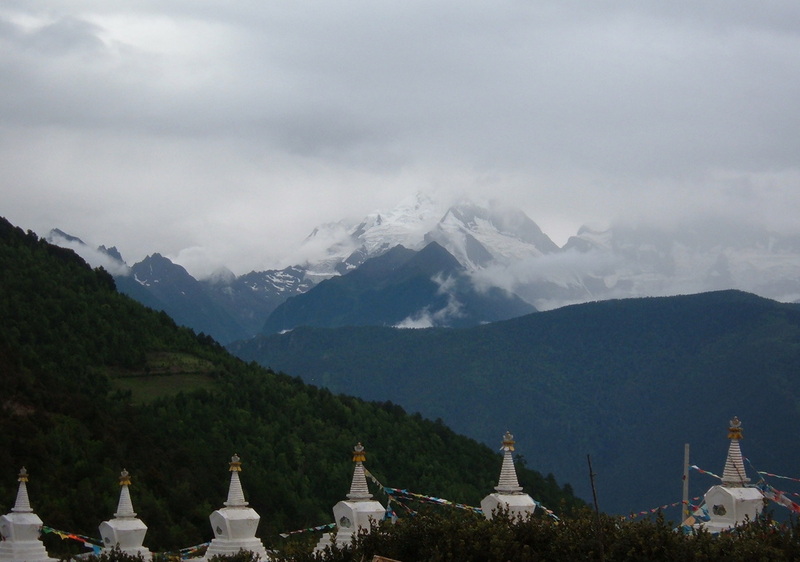 The more important monasteries each owned a couple hundred villages. Outside of the village of Yenokavank in northeast Armenia, we camped on a cliff next to a tiny chapel perched on the edge of the rock face. It was missing the roof and the altar was a large stone. 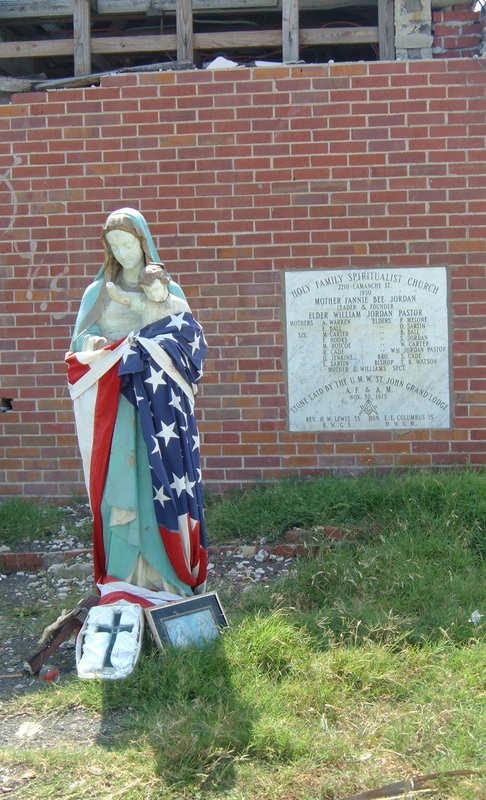 We thought it was abandoned until a woman and her daughter arrived to pray. 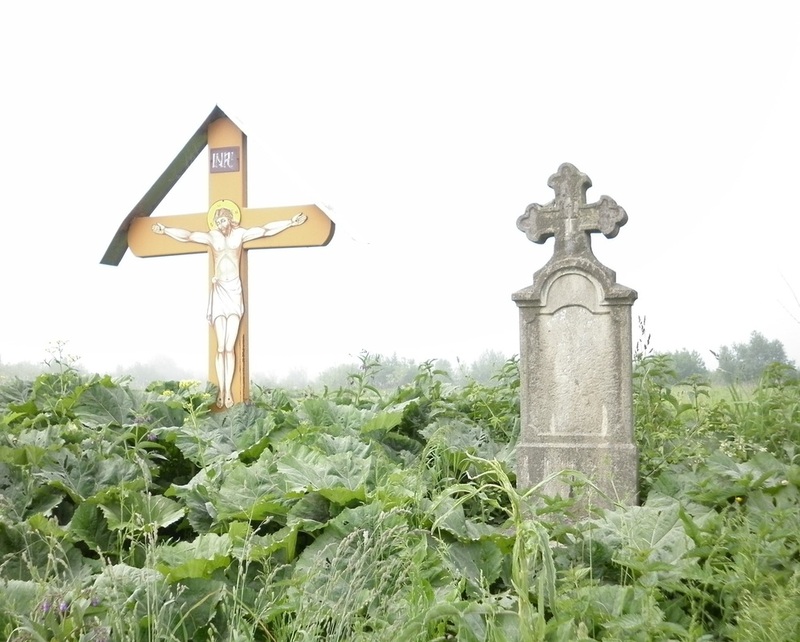 After they left, we noticed the icons, flowers and crosses wedged between the stones. The walls were covered with centuries-worth of soot and wax. At chapels, Armenians push thin, yellow candles against the wall to affix them while they burn.